Millennials Voted In A Congresswoman Who "Can't Afford Rent"
Alexandria Ocasio-Cortez, the young socialist Democrat who unseated a GOP incumbent in New York, isn't just the youngest woman ever elected to Congress, she is apparently also the poorest. The young socialist has a problem on her hands, she can't afford her rent. What would the socialist solution be? To distribute the wealth from people who worked for it to pay for her bills? Whether you approve of it or not, that is her plan. 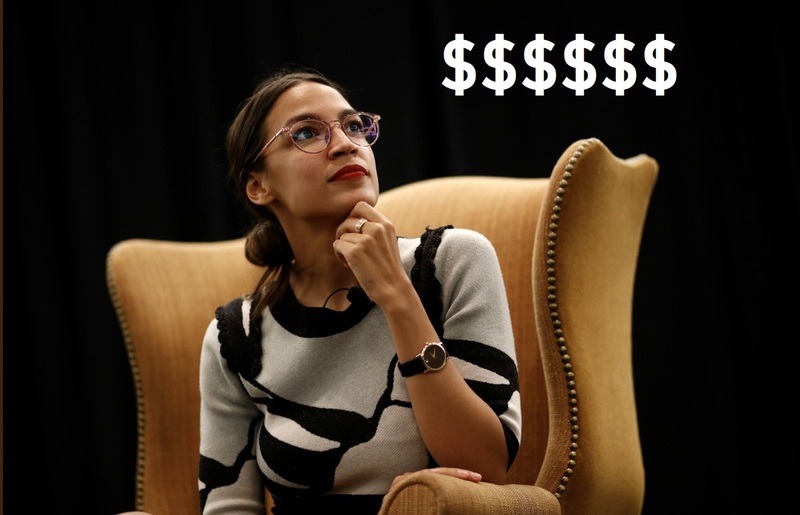 Ocasio-Cortez told the New York Times she is waiting for her first paycheck from the taxpayers before renting an expensive apartment in Washington D.C. She is really living up to her nickname the "millennial Congresswoman". Ed Henry of Fox News called out Ocasio-Cortez for not telling the truth because she wore "multi-thousand dollar outfits" in a magazine but she pointed out that the clothes were allegedly lent to her for the photo shoot. If miss Ocasio-Cortez can't manage her own finances, what business does she have managing the city's hard earned tax dollars? The self-proclaimed "socialist Democrat" was elected to New York's 14th congressional district after campaigning on poverty, wealth inequality and immigration. She describes herself as working-class and her prior work experience consists of being a waitress in restaurants. But she can't be all broke, when she ran for office she raised $1.8 million for her campaign compared to the $1,900 spent by her opponent, where did all that money go? In an interview with Bon Appetit magazine, Ocasio-Cortez said, "For 80% of this campaign, I operated out of a paper grocery bag hidden behind that bar." At least she isn't lying about being broke when she revealed her financial disclosure it showed that she earned $26,5000 last year. This could almost be seen as a 'hidden-in-plain-sight' signal to lobbyists and special interest groups who are shopping for political influence. She took to Twitter to complain about how the American electoral system "isn't designed for working-class people to lead". Another Twitter user agreed adding, "Goes to show how divorced the system and most elected officials are from normal people that a normal person can't readily begin to serve without starting out wealthy." Yet another user added, "That's reality for a lot of people. Will be nice to have someone in Congress that literally understands the struggle." Perhaps the real problem is that immediately upon being elected to represent a district, that person moves out of state and away from the communities they are supposed to represent. This points to a deeper disconnect in the political system when it comes to how centralized government is. Soon, all of Ocasio-Cortez's problems will be over because she will be bringing in a whopping $174,000 a year. People have raised the issue with Washington D.C.'s insanely high living costs in the past. Representative Kristi Noem told NPR that she even sleeps on a pullout bed in her office when Congress is in session. With the available video conferencing technology we have today, it makes no sense for politicians to be so far removed from the people they represent. Washington D.C. should be broken up and the political areas spread throughout the country. After all, anyone can attend a conference call with the press of a button and have their faces included as well.